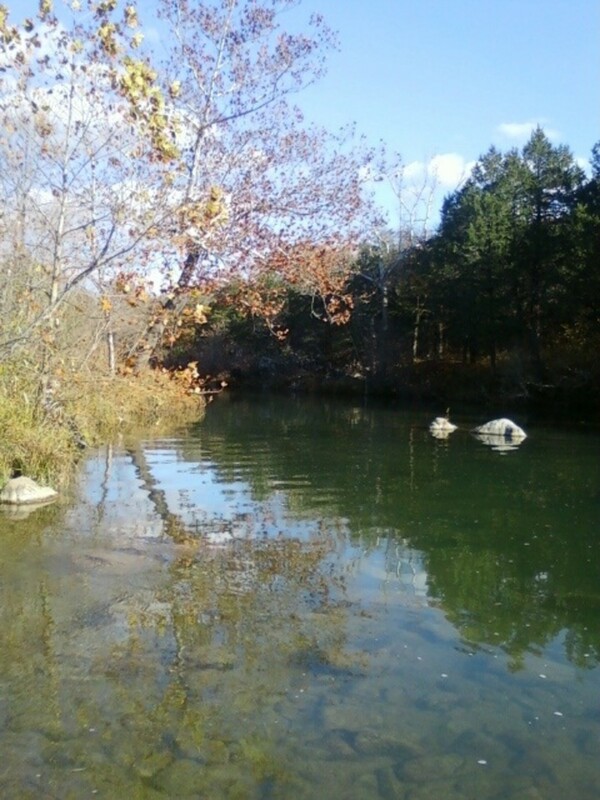 The Blue River Public Fishing and Hunting Area is managed by the Oklahoma Department of Wildlife Conservation (ODWC). It is located about 11 miles from the town of Tishomingo in south central Oklahoma. The Bill and Valerie Plaster Wildlife Management Unit located in the northern part of the area. Camping is not allowed and access is limited to walk-in only. Blue River Campground located in the southern part of the area. Camping and parking are allowed in designated areas. The Carl R. and Ruth Walker Landrum Wilderness runs north to south and joins the Plaster Wildlife Management Unit to the Blue River Campground. Camping is not allowed and access is limited to walk-in only. 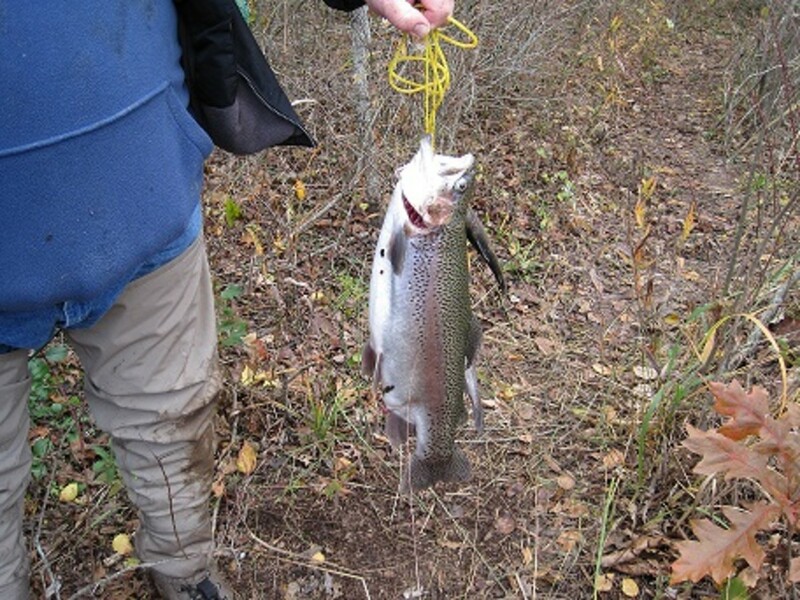 Of interest to trout fishermen is the seasonal trout fishery the Blue River offers! 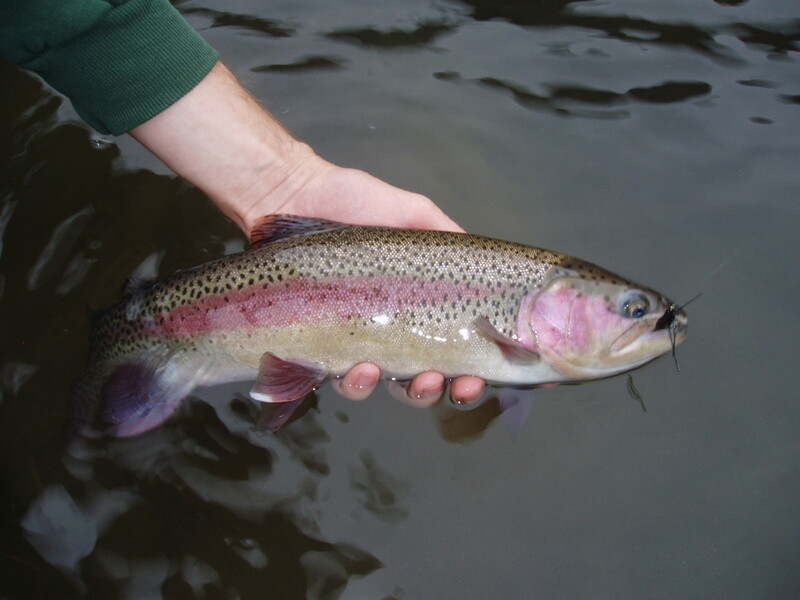 From November 1 through March 31, the ODWC stocks the river with Rainbow Trout on a weekly basis. Moreover, additional stockings of trophy-sized Rainbow Trout take place usually in conjunction with the Trout Derbies held in November during the Veteran's Day Weekend and in February during the President's Day Weekend. For more information about the area, do check out the Fishing Guide published by the ODWC. 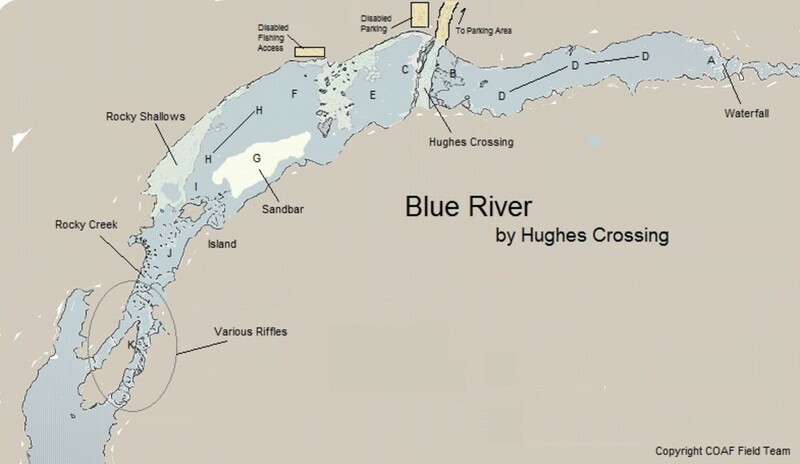 Hughes Crossing is located within the Blue River Campground on the southern end of the Blue River Public Fishing and Hunting Area. Historically used as a river crossing, it is still in use today as a low-water crossing to access camping sites. Do proceed with caution when crossing as water level and flow will change as weather conditions dictate, and watch out for fishermen! The crossing is a popular site for fishermen, providing easy access to trout lurking in the pool to the north and the run to the south of the crossing. Hughes Crossing is also a good reference point to describe suggested areas to fish for rainbow trout in the area. 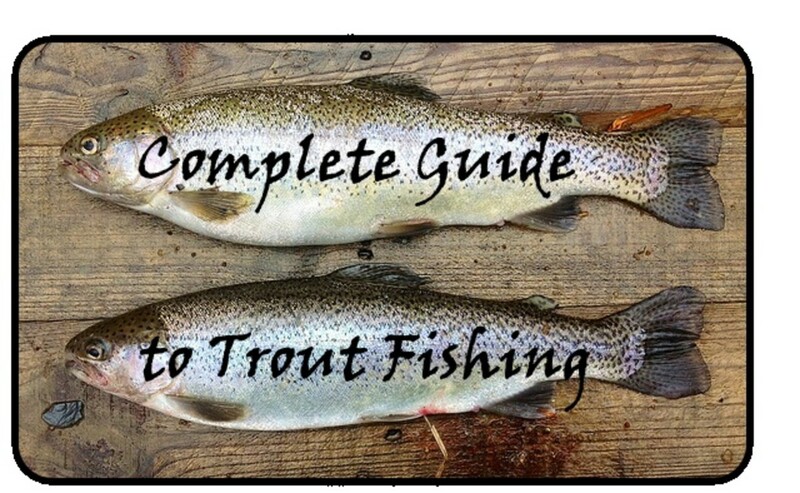 Do check out the Suggested Areas for Rainbow Trout Fishing section below. Bank fishing is limited but accessible. Wade fishing is good, weather and river conditions permitting. A. Waterfall. A horseshoe-shaped waterfall that offers good opportunity for trout. Be careful of the steep and rocky bank. Also, the water flow can be strong depending on recent rains, so plan to adjust your gear appropriately. B. Hughes Crossing (Left). As you approach the crossing from the Parking Area and scan the area to your left, observe the rocky bottom. Note the gaps between the rock formations and where the water deepens. This area will hold trout at times. C. Hughes Crossing (Right). Scanning to your right, observe the water flowing over the crossing and downriver. Note the areas where the most bubbles are forming. Work the seams of these areas, and the "bubble line"; this area will hold trout as well. D. Waterfall to Hughes Crossing (Left). Along this section of the river, note the areas where the water flow slows down, and the deeper areas. These areas are also good for trout. E. Downriver from Hughes Crossing (Right). Observe how the river deepens as it flows from the crossing to the boulders rising from the water downriver. This area will hold trout. The key is being able to cast to the area, and adjusting your rig based on the water flow. F. Disabled Fishing Access. The area directly in front of this access is strewn with rocks and several boulders. Depending on the water level, they can be easily seen rising from the water. Also, if the water level is too low, trout will tend to go elsewhere. When fishing this area, a float versus a bottom rig should be considered to reduce lost gear. G. Sandbar. A favorite staging point for wade fishermen as it provides good access to deeper water (H) and is a prime spot at times for trout! H. Deeper Water. A pool accessible from the bank as well as from the sandbar. 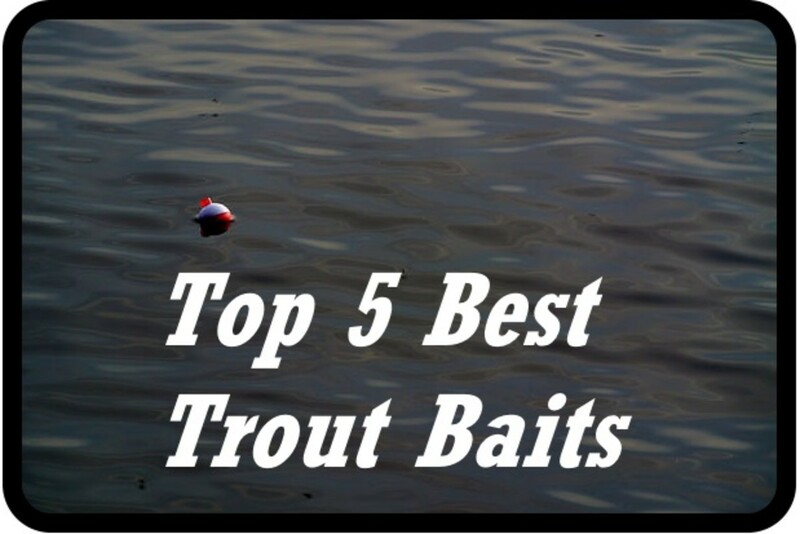 Bait fishermen tend to do well from the bank while wade fishermen using fishing flies and spinning lures/spoons tend to do well from the Sandbar and the Rocky Shallows. I. Channel. This channel runs between the rocky shallows and the island that divides the river in two as it flows downstream. Trout will tend in the Channel and action can be good. 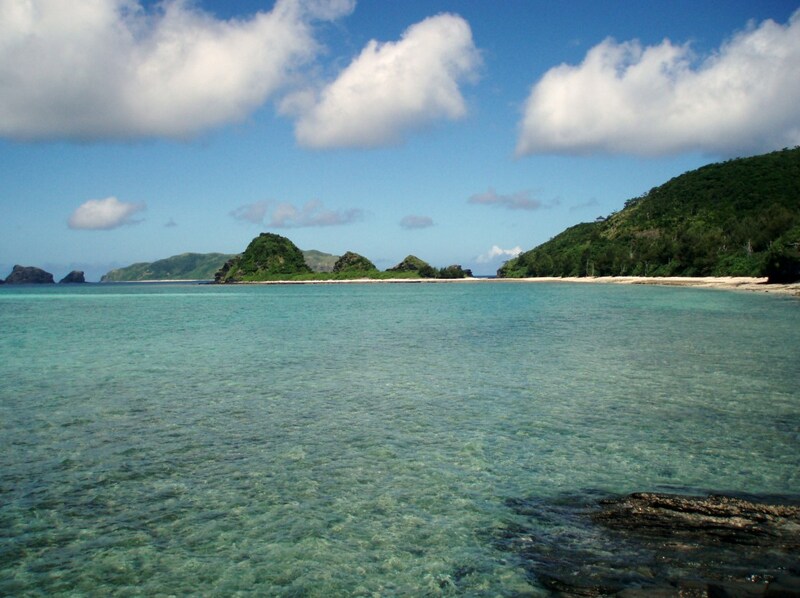 Also, if positioned by the Island, access to deeper water (H) as well as the Channel (I) is provided the fisherman. J. Rocky Creek. Past the island, the river becomes shallow and rocky with a mix of 2'-3' deep pockets where trout will hold. Good at times as well as frustrating when the trout become lock-jawed. This is made worse when you can see them lurking only a few feet away! Be sure to tread lightly, else the trout will spook. K. Various Riffles. Another shallow run that is rocky, making wading tough at times. Also interspersed with riffles that foam with water flowing past. Tread lightly as well; trout lurking nearby will spook! 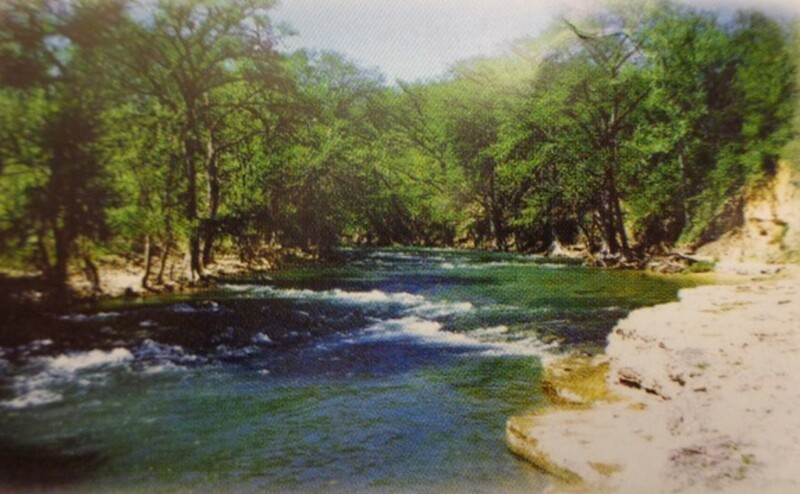 Review the Blue River Public Fishing and Hunting Area brochure published by the Oklahoma Department of Wildlife Conservation. Be sure to have your Oklahoma fishing license and driver's license on you at all times. Be ready to present them to the game warden when asked. Bring chest waders instead of hip waders. This will afford you access to more productive areas. Wade fishermen should bring a wading stick. The rocky bottom makes it tough to wade. At some point, you will wish you had one. Bring a change of clothes, as at some point you will enjoy a dunking. Also, dress in layers as temps will vary at times. Be prepared to be cold and get colder as evidenced by the ice forming on your rod guides. For fly fishermen, bring Wooley Buggers, Gold Ribbed Hares Ear Nymphs, Prince Nymphs, Flashback Pheasant Tail Nymphs, midges, and San Juan worms as a good start. But, do check out the locally tied fishing flies at Scotty's Blue River One Stop (@blueriveronestop) for more suggestions. Bring polarized sunglasses! 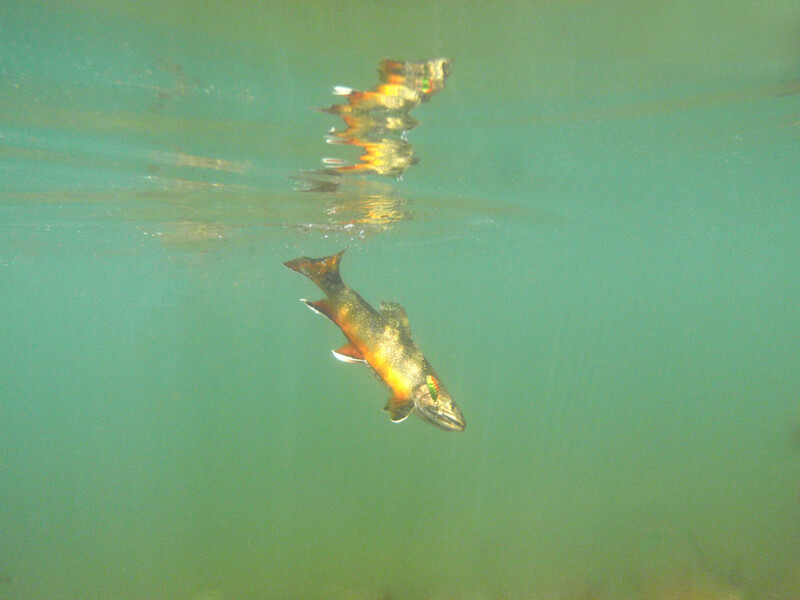 This will allow you to see lurking trout as well as see the river bottom—rocks, holes, pockets, and shallows. It will make a difference! Bruiser trout caught during the Trout Derbies held on Veteran's Day several years ago. We hope this article is helpful for those planning a trip to the Blue River. The fishing can be great at times as well as frustrating. There are other areas to fish along the river that are just as good if not better than the area by Hughes Crossing. Do check them out when you get the opportunity. The Catch-and-Release Area located upriver from Hughes Crossing provides an excellent opportunity for rainbow trout, and is often less crowded than the areas downriver. If the Blue River does not receive a trout stocking until November, and it's not November yet, what to do? Go to the Lower Mountain Fork River and Beaver Bend State Park and enjoy some year-round action for Rainbow Trout and Brown Trout. 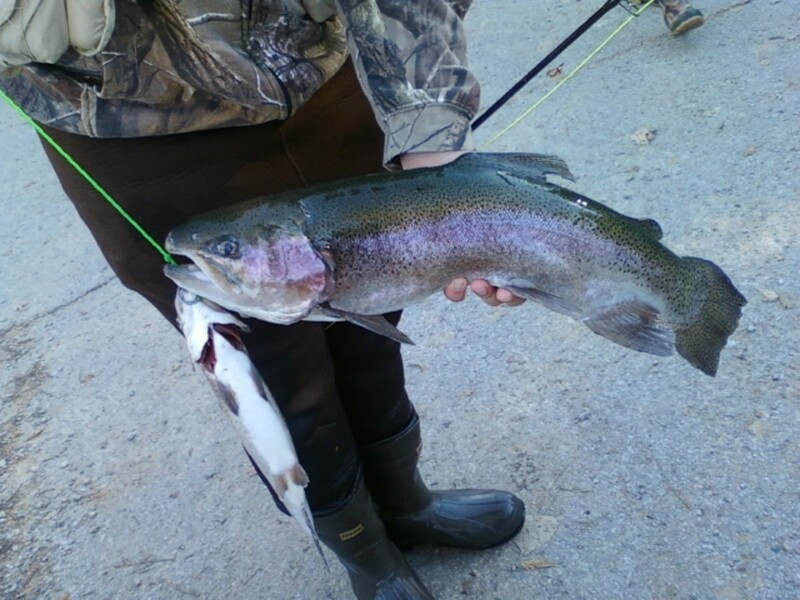 At the Lower Mountain Fork River, I had a great time (catching and losing) little wild rainbow trout, catching a brown trout for the first time, and catching one stocker rainbow trout that made for a nice breakfast! Do keep the Lower Mountain Fork River in mind when itching for rainbow (and brown) trout fishing! New year, new season... made it back to the Blue River for rainbow trout. Had a great time catching a limit; had a great time catching and releasing them, too! Had some wind to deal with and the water was still cloudy from the rain earlier in the week. Regardless, really love this river that is less than two hours from us! Made a run across the border from Texas to Oklahoma. Trout stocking started again for the Blue River; had some great action! PS: Trout Derby is next weekend! They stock some bruisers for the event. Trout Derby was in progress and colder temps and change in weather had things mixed up this round. 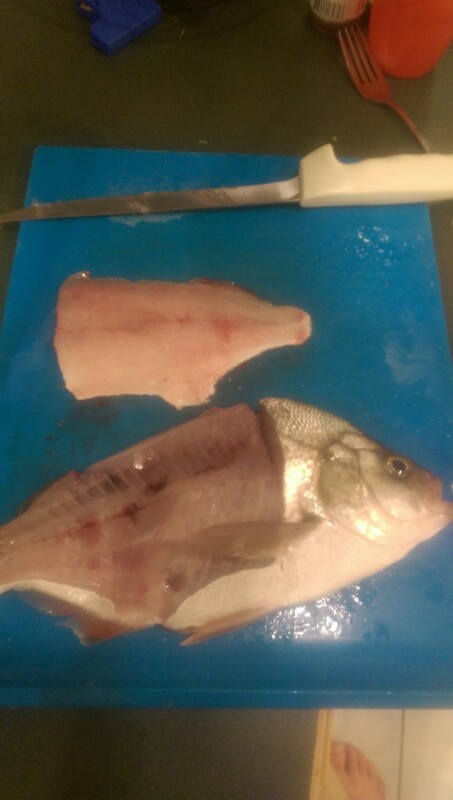 After fishing the area hard, only caught two this round! Did see some bruisers; even got some video of a couple that were lurking in the area! Weather forecast at the start of the week indicated rain and cold temps for Saturday. Later in the week, forecast changed to no rain and temps in the 30s-40s. Decided to make another run across the border for more fun trout fishing on the Blue River. Made it back for more fishing fun on the Blue River! Good excuse to go fishing! There are a number of hiking trails in the WMA. Some are along the river but will wind in/out of woods. Also, not certain but tubing may not be allowed. Do check out the Blue River Public Fishing and Hunting Area Facebook page to get more info as well as contact them directly for more suggestions. Have fun on the Blue and do plan to fish! I am not a fisherman but I have some coworkers who will be traveling with me who are. I want to go for the quiet and the time away from the city parked by a river. Looks like my coworkers will have a great time fishing but my question is...Are there places to walk along the river, hike in the woods, tube down the river and walk back etc. or is this really better place for just the fisherman? Great time yesterday! New video posted - see section "Back On The Blue River..."! New video posted! Fished the Blue River Saturday (12/6/2014)... limited out! Posted recent video for the 2014 Season... check them out! Nov1, Nov8, and Nov15! Made it the Blue on Saturday! Check out the action in the video posted above... see "Back to the Blue River" section. Called up Scotty's and confirmed the Blue River has been stocked! May need to check it out this weekend! 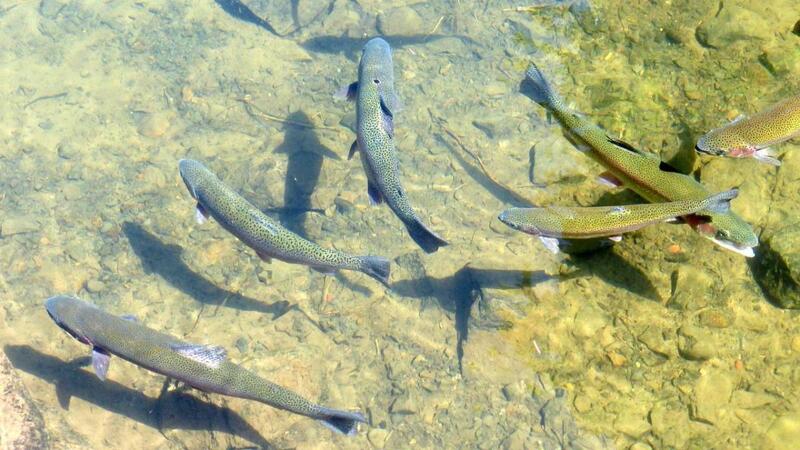 Trout Stocking Season starts in November. Fishing License is up to date; ready for some action! For now, did run up to the Lower Mountain Fork River at Beaver Bend State Park Saturday and caught a few Trout as well as lost a nice one! Check out the video in the section above for Lower Mountain Fork! Added a video of a trip to the Blue River this past November 2013! It's a video clip of a fisherman fishing the Catch and Release Area! Trout Derby in full swing; saw a lot of Bruiser today. Only managed three Trout between the two of us; largest went 14" in size. But, did get a video of a 9 pounder caught this morning. Already in the ice chest but it still looked big! Trout Derby is planned for February 16 and 17, 2013! Should see some Bruiser Trout!